and I couldn’t feel my hands. It’ll be the same feeling there, but it’ll definitely be worth it. I’ll be so excited I probably won’t even be worried about how cold it is. It was quite a time at the Outdoor Classic this year as we all trekked out to Hershey to beat on the Bears. It certainly wasn’t cold–I was probably over-dressed and never even bothered to put my gloves on, of which I had two pairs. The Wednesday before, I made the trip up the pike to the Wyoming Valley to see the Phantoms take on the first-place Pens. It didn’t go nearly as well as the outdoor game. All four “top” teams in the viper pit known as the AHL Atlantic have 24 wins. It’s just a matter of the games you’ve played. Enter Providence for tonight’s game. They are one of the “top 4” and yet we haven’t played them yet this season, until now. There are only a couple more with them at PPL and a couple on the road the whole season, but an opportunity to steal points and limit theirs. Winning is paramount, of course, but regulation winning is the real power play. The big news the other day is the return of D Travis Sanheim. The youngster returns to the Phantoms after receiving paltry playing time with the Fly guys. Indeed, he’s a work in progress, but it’s hard to make progress when you’re sitting on press level in a suit. For Travis, I think of this more an opportunity to get back on the ice, work on the things that Philadelphia wants to see, and then get back up there and get in the NHL games. If Philly doesn’t have it together enough to get that to work, than we’ll take him and be all the better for it. D Mark Alt will take his place with the Flyers for now. 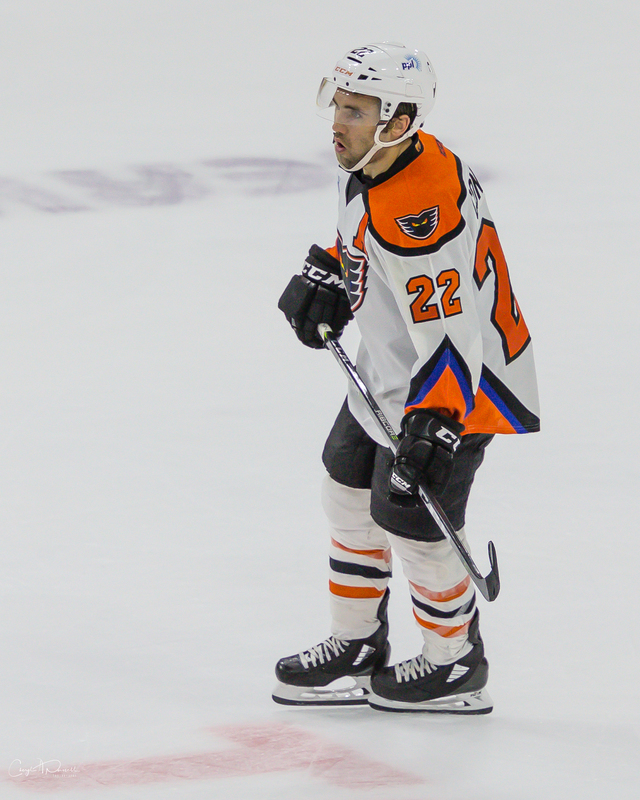 F Tyrell Goulbourne remains with the Flyers, but is not getting much ice time. When he has been out there, I’ve heard good things. D Reece Willcox and D Sam Morin both left the outdoor game with injuries. I’m expecting Reece back but it’s unclear if Sammy’s injury is a re-injury or something new. It’s been plaguing him though. F Misha Vorobyev is close to returning; he’s been out injured since mid-December. F Corban Knight is skating non-contact. He’s a week or two away. Forward Phil Varone enters the week leading all Phantoms and is tied for the league lead in scoring with 42 total points (11 goals, 31 assists). Third among all AHL players with 31 assists, Varone has recorded 10 multi-point outings this season. Forward Oskar Lindblom was added last week to the Atlantic Division roster for the 2018 AHL All-Star Classic. He’s currently tied for second among all Phantoms and tied for seventh among all AHL rookies in scoring with 28 total points (12 goals, 16 assists). Varone, Lindblom and Nic Aube-Kubel enter the week as the only Phantoms to have appeared in each of the team’s 42 games to date. Aube-Kubel is currently eighth among all Lehigh Valley skaters in scoring with 24 total points (11 goals, 13 assists). Defenseman T.J. Brennan enters the week leading all Lehigh Valley defenders and third among all AHL blue-liners in scoring with 28 points (8 goals, 20 assists). The All-Star defenseman is currently riding a four-game point streak (January 13 – present) (3 goals, 2 assists) and has tallied 10 points (6 goals, 4 assists) over his last 10 games. Lehigh Valley is 22-1-2-1 when scoring three or more goals this season and is 20-2-0-2 when allowing three goals against or fewer. The Phantoms are currently tied for second in the AHL with 12 one-goal wins this season. Lehigh Valley is an impressive 12-1-2-3 in games decided by just a single goal this year. The Phantoms are 24-0 when scoring the winning goal. With Saturday’s victory in Hershey, the Phantoms improved to 13-3-1-1 when scoring first this season. Wait, What’s Going On In Reading? The Phantoms have been pilfering a fair amount of Reading players of late, but the Royals have held their own. They are currently in fourth place in the ECHL North, and have gone 6-4 in their last 10. Doors at 6:00PM and the show starts at 7:05PM tonight; you can expect the puck to drop at around 7:17PM as is our ritual this season. It’s post-game player photos, so start scoping out the map and the locations during the third period if you care more about that than the hockey. And remember that autographs are usually discouraged at this type of event so that everyone can get a chance at the photo. Security will likely prevent you from bringing sticks and weapon-like items to be signed. Hopefully the curse of the “post-game player event” does not prevent us from defeating Providence. As per usual on a Wednesday, good seats are still available. Wednesdays are for the hockey fans! The Bruins–Bears by any other name–have been at or near the top of the standings all season long, despite this being our first match against them. I see some familiar names on their roster, but nobody who demands a paragraph. However, I feel like that Zane McIntyre has given us problems in goal before. 27 Austin Czarnik is their top scorer. Czech defenseman 38 Jakub Zboril has been having a nice season. And their other goalie, 35 Jordan Binnington, a Calder Cup veteran with the Chicago Wolves, is having an excellent season as well. I’m always looking at the goalies first, and today is no different. Alex Lyon did well in the outdoor game the other day, under difficult conditions when you consider the outdoor ice surface and the lighting and whatnot. Dustin Tokarski didn’t look like a world beater in the game up in Scranton, but I’m not sure he was getting the best defense in front of him that night, either. And you know, that’s really the thing. Scranton is always coming up with these goalies–their third string guy only gave up two goals all weekend last week–but a lot of their success is probably due to a really good defense in front of them. So watch the defense tonight to make sure they’re not leaving the goalie out to dry. There was an injury to Raffl from Philly last night, so I have heard speculation of a forward going up. Watch to see urgency from the attackers tonight. Everyone in Philly wants Lindblom because they want to see him play and they’re too lazy to drive to Allentown. Is he ready? Keep an eye on him tonight. Watch Sanheim, of course. He’ll be in #6. Coaches have told him that he can get the good ice time with the American League team and “not have to worry about making a mistake.” Well, we’re trying to win around here, too, so hopefully he just plays his game, joins the rush, and shakes off the rust. These games still count. We’ve had the veteran scratch problem again, which has caused some 11F/7D lineups. Read was a scratch outdoors, and O’Neill was a scratch in Scranton. If Misha is ready, perhaps we’ll be back to 12/6. Watch how those lines shake out and if we can start to get back to rolling 4 scoring lines instead of some of the checking lines we’ve had lately. Providence doesn’t seem to be anything special on PP or PK, so winning in those areas might be a way to get this game. It’s a string of four in a row at home, as Wilkes Barre will be in town on Friday and Utica on Saturday. Saturday is Star Wars Night with mini-sabers for the kiddos. Sunday and Monday are All-Stars in Utica.